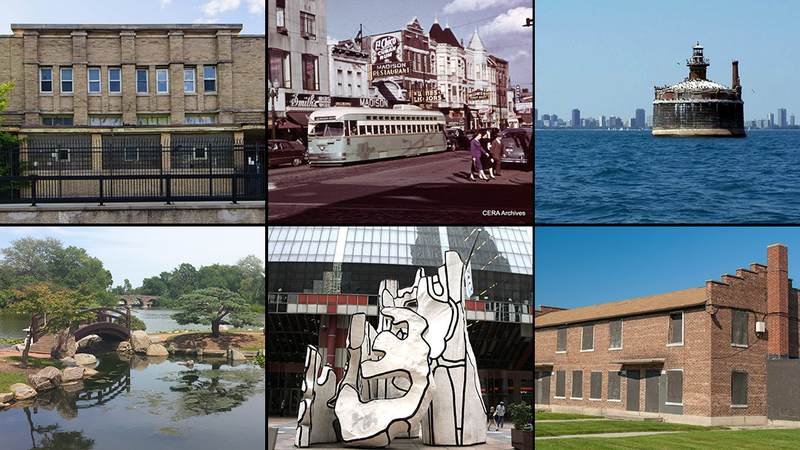 This year, Preservation Chicago’s annual list of endangered structures sounds the alarm on not just buildings, but also public art. The group is also concerned about the effect a prominent construction project will have on one of Chicago’s most beloved and historically significant parks. “We usually make our announcement around the first week of March to coincide with the anniversary of Chicago’s founding, March 4, which we feel is a significant time because these buildings tie to the city’s history,” said Ward Miller, executive director of Preservation Chicago. Below, a Q&A with Miller, interspersed with information about this year’s list. Chicago Tonight: What’s the process for selecting your seven sites? Ward Miller: From year to year we collect ideas and suggestions from the general public, our membership and our board of directors, which is very diverse group who live throughout the city of Chicago. They bring all these issues to us, and we also pick up topics in the news. For instance, the work being done on the Sears Tower and the potential displacement of the Alexander Calder there, that it could be sold like the Henry Moore was sold to a private individual at auction. And we hear from other organizations concerned about parks and green space that are also part of news stories. We typically have about 40 to 70 possible buildings, sites, structures, or landscapes where there’s interest. From that, our board narrows it down to about 25. With those 25 we do a little bit more community outreach – talk to aldermen about community priorities, ask the city and learn about their hot topics. Our board makes the final selection in mid-late January, which allows us about three to four weeks to assemble all the information and research around each one and photograph all these sites. So between the end of January and the first couple days of March there are a lot of things that happen! Altgeld Gardens, 976 E. 132nd Pl. Architects Naess and Murphy originally built the Altgeld Gardens public housing complex in the 1940s to house African-American servicemen returning stateside after World War II. The two-story buildings link together around park-like settings. Altgeld Gardens is where President Barack Obama did much of his early community organizing and is on the site of a stop on the Underground Railroad. Union Station Power House, 301 W. Taylor St. The prominent firm Graham, Anderson, Probst & White designed the strongly vertical art moderne Union Station Power House that dominates the Roosevelt streetscape in the South Loop. It was part of a network of buildings Graham, Anderson designed in the 1920s, including Union Station itself. The Power Station has been out of use since 2011. Last year’s list included two Children’s Memorial Hospital buildings, the Martha Wilson Pavilion and the Nellie Black Pavilion, that were demolished in the past year. What are your thoughts on those losses? Miller: I think there were some concessions, observations and discussions that resulted in what could be better building, but it’s not a success story from the traditional preservation front. But we may have had a positive impact because the proposed new building going up on the Nellie Black site looks to be in the spirit of the original building – it’s a new building but they saved some details and incorporated these details. Is it preservation? No, however, is it an acknowledgment that the scale and the massing are important, the details are important? Yes. And there may have been some positive impact there even thought we were unable to save the historic building. Cornell Store & Flats, 1230-1232 E. 75th St.
Cornell Store & Flats in the Greater Grand Crossing neighborhood is one of few commercial buildings built in the prairie style of architecture in Chicago. Designed by Walter Burley Griffin, who worked for Frank Lloyd Wright early in his career, Cornell Store and Flats is an exceptional example of the intricate brickwork emblematic of Chicago’s prairie style. Madison Pulaski Shopping District, 4000 W. Madison St. The intersection of Madison and Pulaski (previously Crawford) was one of the handful of shopping districts that anchored neighborhoods all over the city. Department stores, shoe stores, movie palaces and hotels were housed in art deco, art moderne, modernist and gothic structures that have fallen into disrepair since the 1950s. Another building featured in two of your lists, St. Adalbert’s in Pilsen, has been back in the news lately – there’s a conflict between parishioners who want to save the church as a place of worship, and a music academy who wants to purchase the building for its own use. Miller: St. Adalbert is a remarkable story because there’s a lot of litigation and robust discussions, a lot of community interest. We can’t get into issues of ownership or faith, I’m very careful to walk that line of preservation. One of the most interesting things we’re forgetting, years ago there were discussions of possible demolition of this building – now nobody’s talking about demo but everyone’s struggling with efforts to pursue ownership and different issues, from music center to community of faith. Isn’t it fabulous that we’re having this discussion over a remarkable church, to have all these people so interested in St. Adalbert’s? I think it’s impacted Chicago’s view on how these buildings can be reused beyond their initial construction, and we’re excited about that. It’s a great example of where people really care and are concerned and want to see the best outcome. Buildings like this are cultural treasures, and we need more people dedicated to protecting our cultural treasures. It’s all part of our cultural fabric, and when you lose them, you lose a lot. Chicago’s water cribs were constructed several miles out into to help deliver clean water to the city by bypassing the sewage-laden water closer to shore and drawing water from deep into the lake. The cribs were connected via deep tunnel to pumping stations on the shore and were considered major engineering feats. Six currently exist but only two are still in active use. The Wilson Avenue Crib and the Four Mile Crib are currently slated for demolition by the city. As some of the best-known and most historically significant parks in the city, Jackson Park and South Shore Cultural Center Park are not threatened by disuse or deterioration, but development. Preservation Chicago is concerned by the lack of public engagement in plans for the Barack Obama Presidential Library and a Tiger Woods-designed golf course and what those developments might mean to the historic character of these South Side parks. Downtown Chicago is home to more than 100 sculptures, mosaics and paintings created in the 20th century for public display, including iconic works like the Alexander Calder’s “The Universe” in the Willis Tower lobby, Jean Dubuffet’s “Monument with Standing Beast” in the Thompson Center plaza, and of Joan Miro’s “Moon, Sun, and One Star” across from Daley Plaza that many Chicagoans consider essential to the public streetscape. In recent years, changes in building ownership, changes to building architecture, and private sale of the artworks have removed or obscured some of these from public viewing. Feb. 22: The walls of a South Side armory tell the history of warriors throughout the ages. Geoffrey Baer shares that story and more in this week’s Ask Geoffrey. Feb. 20: The former Johnson Publishing building is up for landmark status, but what does that mean for the future of the only black-designed high-rise in downtown Chicago? March 2, 2016: Preservation Chicago has released its annual list of the most endangered buildings in Chicago, a list they usually call “the Chicago Seven” – but for the first time in 14 years, the organization has included an eighth structure.